Songs for ESL kids teachers. 2 free songs – What Time Is It? & Let’s Get Dressed! All of our 50 songs now have British English versions! 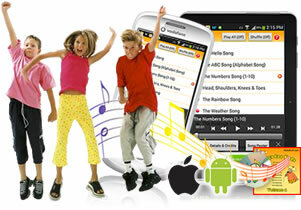 American English and now British English songs on ESL KidStuff! We have received many requests for British English versions of our songs and we are delighted to have finally recorded professional versions with two fantastic British vocalists. Enjoy! NEW: Our Kids English Songs App is now available for iphones and ipads! Play our 50 songs on our new app on iphones, ipads as well as Android phones and tablets! We are excited to announce our new Songs App – which is FREE for our members! The app has been available for Android devices for a few months and we have finally managed to release a version for iphones and ipads. The app will play all of the 50 songs on our Songs page – so no more needing to download and burn to CD! Yes, we are offering our App for free to all of our members – so as long as you have a membership account with us you can use the Songs App to play our songs in of your lessons. Otherwise the app will cost approx. US$13 on the Play Store and iTunes. NEW: Songs App for your phone and tablet! Play our 50 songs on our new app for phones and tablets! iPhones & iPads: coming soon – please check back regularly for updates. Song Theme: Saying actions with adverbs. Target Vocab: What shall we do?, Let’s have some fun, let’s, run, quickly, walk, slowly, jump, high, crouch down, low, stomp, loudly, tip-toe, quietly, pat our heads, softly, clap, hard. An energetic song with lots of fun actions to do. Song Theme: Saying the present and past forms of irregular verbs. Target Vocab: wake – woke, eat – ate, drink – drank, go – went, sing – sang, swim – swam, have – had, come – came, ride – rode, do – did, put – put, sleep – slept, give – gave, write – wrote, read – read, run – ran. A song with a really catchy tune practicing the present and past forms of irregular verbs. Song Theme: Talking about yesterday using past tense irregular verbs. Target Vocab: yesterday, What did you do?, woke up, ate, drank, went, sang, swam, had, came back, rode, did, put on, slept, breakfast, milk, school, song, pool, fun, home, bike, homework, pajamas, all night. A simple song about things you did yesterday using past tense irregular verbs. Song Theme: Talking about yesterday using past tense regular verbs. Target Vocab: yesterday, fantastic, great, played with my friends, painted a picture, walked in the park, watched TV, jumped in puddles, played a game, kicked a ball, danced. An uplifting song about things you did yesterday using past tense regular verbs. Song Theme: Talking about different jobs. Target Vocab: What do you do?, I’m a …, farmer, bus driver, doctor, teacher, dentist, police officer, chef, hair dresser, nurse, soldier, fire fighter, student. A catchy song practicing asking about jobs and saying 12 different jobs.